Announce A3 Snap Frame PHT01809 – PHT01809 – OfficeYoo! 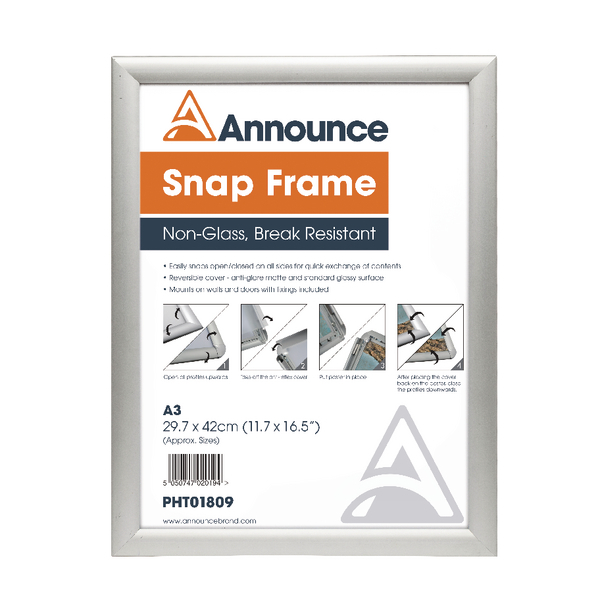 Made with a break resistant cover and 25mm anodised aluminium, this non-glass Announce A3 Snap Frame is ideal for displaying certificates and posters. Featuring a reversible cover that is anti-glare matte on one side and glossy on the other, this frame snaps open and closed with ease for quick exchange of contents. With fixings included, this frame can be mounted on both doors and walls.